Congrats to Allie Greenplate, Danny McClanahan, Deon Doxie, Caroline Roe, Kirsten Diggins, Nalin Leelatian, and collaborators on their publication! Greenplate AR, McClanahan DD, Oberholtzer BK, Doxie DB, Roe CE, Diggins KE, Leelatian N, Rasmussen ML, Kelley MC, Gama V, Ferrell PB, Johnson DB, Irish JM. Computational immune monitoring reveals abnormal double negative T cells present across human tumor types. Cancer Immunology Research 2019 Jan. PMID: 30413431. PMCID in progress. Pubmed. DOI. Online early Nov 2018. ► This peer-reviewed research developed novel computational biology techniques for time series data and applied them to characterize cells in samples collected over time from patients in several studies. Ultimately, this work revealed a novel population of T cells present in different types of human tumors, including brain, kidney, and melanoma skin tumors, and showed that these cells increase over time following kinase inhibitor treatment and are unlike other known T cell populations. This work was led by graduate student Allison Greenplate and was initiated in collaboration with Doug Johnson. Greenplate et al. 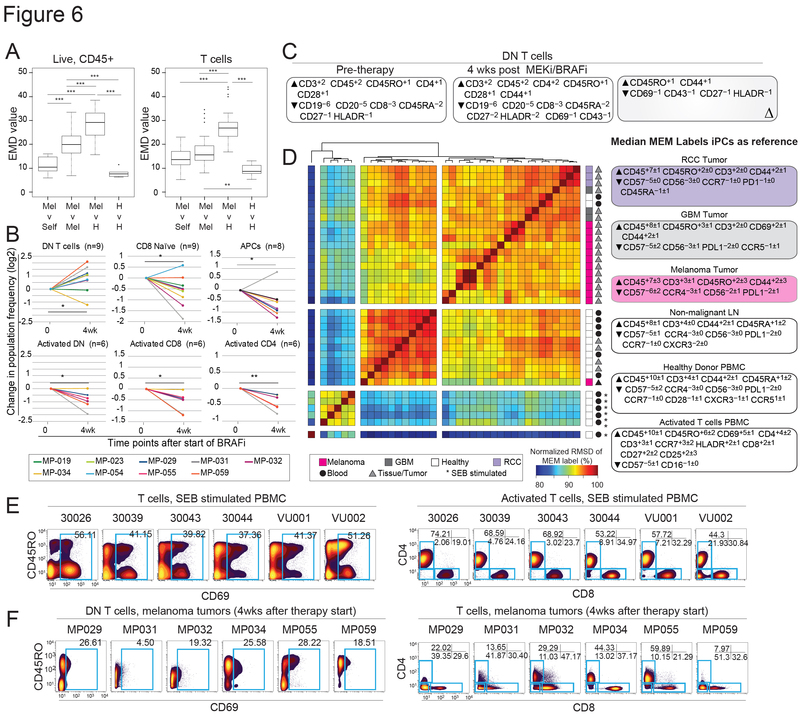 CIR 2019 Fig 6 – Deep characterization of novel CD4- CD8- T cells revealed to be present in multiple human cancer types. FIGURE 1. How mass cytometry enables systems immune monitoring in human patients. 1) Blood samples are acquired from patients prior to the start of therapy and at various time points during therapy. 2) All blood samples are subjected to single cell cytometric measurements, leading to large, high dimensional datasets. 3) Selection of appropriate analytical tools is critical to maximal exploitation of the information available in the complex datasets. Figure kindly provided by A. R. Greenplate. Copyright 2018.